We are Washingtonians who now live in Oaxaca. My wife taught English and worked in the School of Business at the University of Texas Brownsville. I'm an ex high school teacher with a degree in History and a minor in Anthropology. Please check out our Don Pedrillo blog. You can also reach us by email. Our retirement story actually begins back in nineteen ninety-four. We were living in Sedro Woolley, Washington with our three sons where we owned and operated a photography studio. 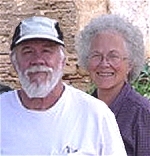 We became disenchanted with the struggle so we decided to sell home and business and retire in Mexico. After much research we decided on the State of Oaxaca. We appreciated the traditions and the manner in which the Oaxaquenos held fast to their culture. We had a friend (Ray) in Sedro Woolley who repaired automobiles and spoke Spanish. Knowing of our decision to move south, he called one day to tell us that there was a gentleman from Oaxaca at his shop. We hurried over to Ray’s (and through him) we asked Felipe many questions. We saw Felipe often and built a friendship. By the time he returned to Mexico, we received an invite to stay with him if we ever came down. A few months later both the house and business sold. We’d bought a nineteen sixty-four-school bus that we packed full including a large roof rack that ran the length of the bus. Most of our friends weren’t very supportive. They wondered why we would leave a good business and the safety of the United States especially with our three sons. I think there were some who thought we’d never reach Oaxaca alive. When I think back about driving that bus through Mexico, I shudder a little. Sometimes innocence or lack of sense opens doors that might ordinarily stay closed. At the time I was the only one in the family who spoke Spanish (very limited) but the boys picked it up quickly as we slowly traveled through Mexico. Many of the roads in Mexico are very narrow especially back in ninety-four. We have a little Toyota pickup now, which maneuvers quite nicely here. But I often think back to that first trip in that big old bus. We made it safely to Oaxaca. The ride down was an adventure that no one in the family will ever forget. We were immediately mesmerized by the foreignness of almost everything. We quickly learned that the Mexicans were friendly and always eager to help. Asking for directions was pretty comical. Understanding the directions was near impossible. We stopped often on the way down ultimately taking two weeks to complete our journey. We used Felipe’s mailing address as a final destination. The address was in Mitla. When we arrived in Mitla (a small town), we asked for Felipe. Word spread around quickly that there were Gringos looking for Felipe and before long Felipe’s brother entered the bus. He told us that Felipe didn’t live in Mitla. He lived in a small rancho and had been sent for. While waiting we looked around and all agreed that this wasn’t going to be too bad. There were sidewalks, the street was paved, many people were dressed traditionally but many also dressed in a more modern fashion. When Felipe got to the bus, we traveled to Union Zapata. Upon entering the village the shock set in. The roads were little more than riverbeds. Many houses were built from carrizo (similar to bamboo) with dirt floors. Many scenes could have been from two hundred years prior. I think a trip into the backwoods of West Virginia in the twenties would have been a major step up. Felipe actually lived in his brother’s home. It was quite large. Felipe’s brother Jeremias built it while welding pipelines throughout Mexico. We were given two rooms and began the adjustment to the strange but marvelous life we would live for the next year. In just weeks the boys were chatting in Spanish and enjoying their freedom. We’d planned to home school but ended up allowing our sons to experience life. We’ve never regretted that decision. They have memories that will be with them forever. In many ways life was tough; washing clothes by hand, carrying water up from the well, trying to fit in, and of course attempting to learn the language. Your story with the bus and immersion in local community and culture is fantastic! I loved reading this and brought back memories and thoughts of our own “empty nester” experience. Our story began in 2006, our first time visiting Nicaragua, Central America, with our youngest son, then 15. It was love at first visit! On the last day of our Spring break trip we bought a run down decrepit property in the Colonial city of Granada… Thinking we would one day fix it up and use it as a springboard for future travel and discovery in Latin America for ourselves and our four boys. By the time we landed in Chicago we had designed the house and started long distance construction immediately, much like yourselves. After six months our dream home was completed! A few years of visits and initiating an art program in a local school meant that by the time our sons had all finished high school we already felt like we were more at home there, than in the U.S. We arrived with our suitcases a few years later for six years of life and adventure. We kept a blog,for friends and family (initially) which covers all the trials and tribulations of our lives there and the initiation of a social impact business. Hello, thank you for your post. Funny we’re also from Washington, we live comfortable here in the states but it’s just not what feels right. I was watching House Hunters International a couple of days ago and seeing the prices of homes it just click to us we really need to get out of the state’s with the kids and spend the rest of our lives feeling happy new relax. At this point we really need to meet someone who can help direct us what our 1st steps should be etc. I am looking for a modified assisted living arrangement. I love Oaxaca, been there many times. At my age, 83, I need help in shopping, cooking, and general housekeeping. I do not need medical assistance. Could you steer me in the direction of such a facility if one does exist. I live on retirement from Social Security and teacher retirement so about $1000 US would be my budget.